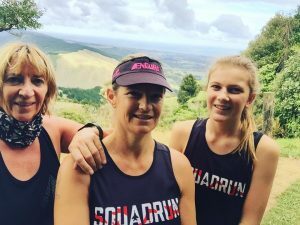 SQUADRUN is very proudly the affiliated coaching partner for the 2018 Tarawera Ultra Marathon. This means the event directors value our deep knowledge and understanding of the Tarawera Ultramarathon and what it takes to help entrants complete the event and achieve their goals. The Event Directors, Paul and Tim, want to see you succeed and to give you the very best chance of doing this they recognition the importance of having a structured training approach coupled with a deep supportive network. 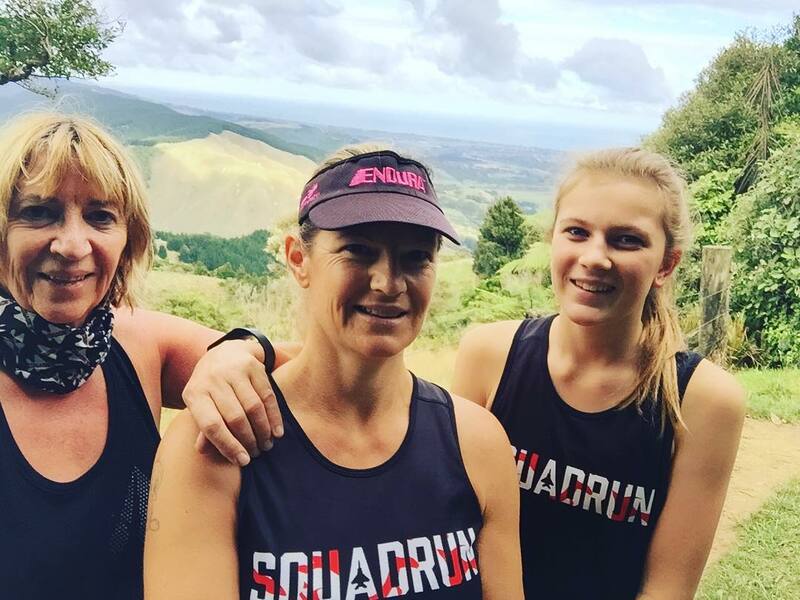 No one knows Tarawera Ultra like SQUADRUN and we’ve created a sophisticated weekly training plan written with intensities specific to you designed to deliver the right training for the Tarawera Ultramarathon. 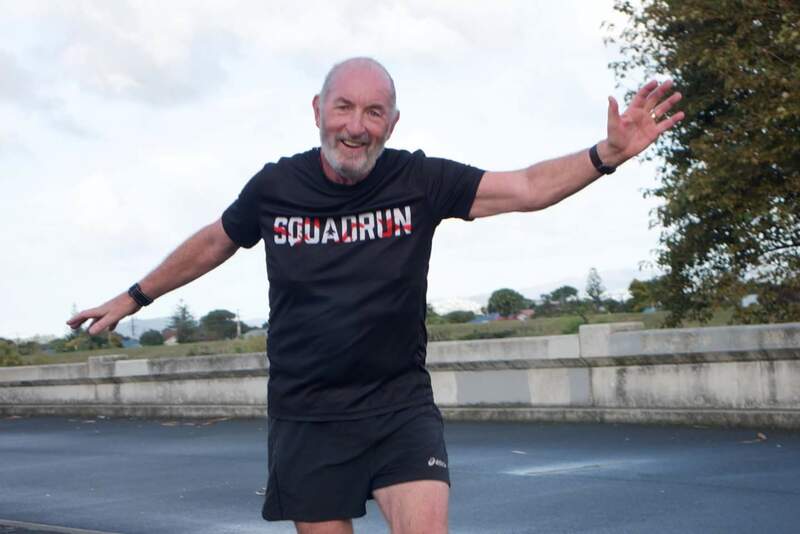 Far beyond being just a training programme SQUADRUN is Australasia’s largest coach-lead running community. It’s a massive network of runners across Asia-Pacific sharing their training journey. We pride ourselves on being some of the most contactable and supportive running coaches in the business. Coupled with our support you’ll enjoy benefits from numerous affiliated partners as well discounts, deals, training camps, group runs, and much much more. 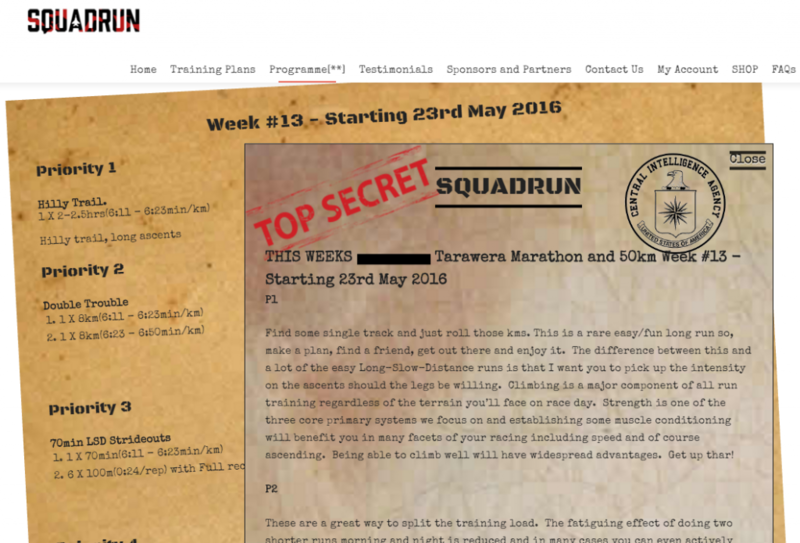 SQUADRUN is most certainly NOT an exclusive club or group. The last thing we want to do is force people to only wear jet-planes and feel that they can no longer mingle with everyone else out there. We actively encourage people to participate in their recreational pass-time in any way they choose. Wear your local trail running cap one day and a SQUADRUN bandana the next. Make use of all available resources and offers that will help foster and develop your training or love for the sport. If another coach has a training camp that you want to attend – GO! If you see us at an event COME SAY HI! We’re inclusive, we’re fun and we’ll welcome anyone of any ability. There would be few things worse for the Trail Running community than exclusive little fragmented groups. We’ve seen this mindset elsewhere and it’s yucky. Everywhere! Your training plan is delivered online and we support you remotely however we travel frequently and as your coach it’s is likely that we will get some ‘quality’ time together before you toe the line in Feb. You’re never alone with the SQUADRUN family and fellow squaddies number in the hundreds across Australasia. It’s almost certain that you’ll have local hook-ups to share your training journey and we’ll gladly facilitate groups runs in your area. You entered an Ultramarathon, you want to make sure you’re going to finish it. At Ultra Trail Australia (May 2017) SQUADRUN celebrated a 96% completion rate in a race that typically sees a 24% drop rate. SQUADRUN athletes are up to 10 times more likely to complete their chosen event than the rest of the field! We’ll actually be there when you finish. No SQUADRUN athlete gets left behind! Get coached by SQUADRUN and receive 50% more finish line hugs! With so many SQUADRUN runners and walkers in the event you can guarantee you’ll get a massive amount of shout-outs and support on your journey towards the finish line. Expect a special kind of care and support from fellow ‘squaddies’ on race day. Be part of the family and feel the SQUAD-love! Literally EVERYONE. We typically say we’re the 85% of the field that excludes those special few shiny diamonds that take their stuff so seriously they’re willing to pay 5-times-as-much for a premium 1-on-1 coaching service. SQUADRUN is the every-day athlete. We’re the walkers, we’re everyone from the tail end through the bottom corner of the podium. The ‘average’ SQUADRUN athlete is a 42 year old, 72kg mum but the shelf is long and the bookends far apart. Will the Train to Tarawera Plans work for me? No. You need to work for you. Regardless of how much you pay a coach (or don’t pay a coach) it’s ultimately YOU that has to ‘lace up’ and do the training. We won’t be there to push you out the door or to watch you while you do it. We’ll try to keep an eye on you to ensure you’re getting along ok (Strava) and remain at your disposal should you need to contact us at any time for help and support but ultimately it’s YOU that must do the training. This said, if you can commit to regular and consistent training on one of the “Train to Tarawera Ultra” plans you will see very real and significant success. Our retention is incredibly high and indicative that the service we provide is effective and represents outstanding value for money. Train to Tarawera won’t work for people that don’t actually want to do the training. 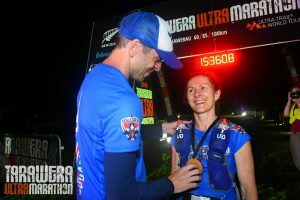 Don’t sign up for an Ultramarathon if you don’t want to do an Ultramarathon and don’t get coaching if you don’t want to run, or walk, this event. It would be a mistake for us to tell you that you need to get coached by us. There is a discipline component to training but moreover there must be a fundamental desire to do it. Tell us you want to be coached and seek us for the training programme. We’re ready to support and encourage those who are motivated to run. Of course interaction on Facebook is entirely optional and we have many of our athletes that merely watch and read information and advice shared there. If you don’t like Facebook and prefer complete autonomy, that is fine also however it is essential you maintain contact with Ali and I for any help or support you require. Because we want the right training plan for you there will be 6 plans written and later tailored to your specific fitness before being delivered for use. 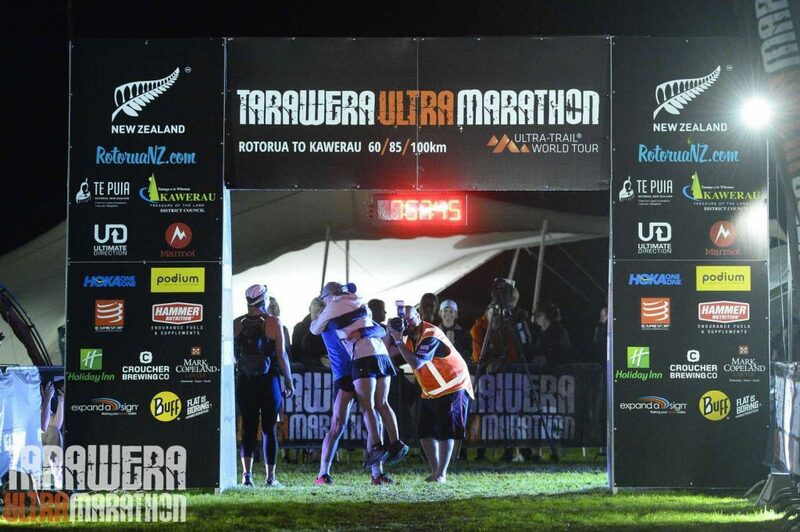 Train to Tarawera 100 miles – L4 You entered a 161km race and you know there will be walking. A ‘miler’ is a fast hike with run-breaks and this is the plan to prepare you for perhaps the biggest race of your life. Train to Tarawera 87/102km – L4 Assumes you currently train in excess of 60km per week, and will build to around 100km per week. Train to Tarawera 87/102km – L3 Assumes you are going to complete the 85/100 and will be able to build up to around 60-70km per week. Train to Tarawera 62km – L2 Starting easy, expect to get up to roughly 40-50km per week. Train to my first Ultra – L1 ‘All abilities’ / ‘starter plan’ for those that will spend a large part of their day walking. Easier than anything we’ve ever written, this one’s for you mum. One of the benefits of having several training plans is YOU dictate your training volumes (we set the training speeds). You may be fairly new to running and looking for some easy training and initially a light-weight ‘my first ultra’ plan will work best for you. After 6-8 weeks you might find you are absorbing the training comfortably and are ready to move up to longer long runs and harder sessions. You need only ask and we’ll bump you up (or down) accordingly. It really is training for anyone of any ability. 70 years old? No problem. 125kg? We can help. Can’t run 5km? You’re not alone! Entered the Ultra but not ready to kick off you’re running just yet? Don’t worry. Kick-off your training when you choose. Our advice is always to begin chipping away at the kms as early as possible but we appreciate you might want to give it a bit until you’re ready to seriously commit to your training. Let us know when you want to get going and we’ll be there to help you on your way. It’s COMPLICATED! Your biggest initial challenge will be understanding the training plan and how to apply it to yourself. If you remember nothing else, remember this – Read the FAQs and take your time coming to terms with how the programme works. It is a ‘priority based‘ training plan, YOU can work into your busy life. It is explained clearly in the FAQs. It really is. Where was that you say? The FAQs! Must I link a fourth time? Ali and I will help you get started and provide the info you need to piece together your programme. The important thing is that if you need help or support, please contact us! Coaching is a two way street and we are more than happy to help you out, just ask! In all likelihood running isn’t the only thing going on in your life and we appreciate that you probably place family and work ahead of your training. GOOD. No sane person would do otherwise. So what is your running to you? It’s the fun thing you do in your spare time and you choose to do it because it’s FUN. So lets keep it that way! No Injuries – you can’t do much if you’re broken. Let’s avoid this at all costs. Let our deep and talented team of affiliated professionals support you in your training and ensure you are in doing the thing right. As a SQUADRUN member not only are you part of the ‘cool kids club’ but you’ll also enjoy preferential treatment with benefits others wont enjoy. I can’t exactly shorten the course for you but I can make your finish line a little better. Expect an exclusive ‘members-only’ marque for you and your supporters right on the finish line. We know Tarawera like no one else and our mainline to the Race Directors means we have all the current and up-to-date info at any time you require it. We also have the local knowledge on where to stay and what to do while you’re in town (oh my god secret hot pools! ).